While we shouldn’t expect our left-wing elitist of a President to understand last Tuesday’s electoral rejection of his “progressive” prescriptions for America, we should expect Senate Minority Leader Mitch McConnell (R-KY) to get it. word “progress,” so-called “clean coal” is a form of Obama-think — a discredited cap-and-trade concept that was more trap than sincere policy. Some in the coal industry and some coal-burning electric utilities had been talked into supporting cap-and-trade, provided that taxpayers and ratepayers forked over billions (if not trillions) of dollars for so-called “carbon capture and sequestration” (CCS) — that is burying utility carbon dioxide emissions deep underground and hoping they stay there safely. But to the extent that any so-called environmentalists paid any lip service to clean coal and CCS, it was only to lure coal and utility suckers into cap-and-trade. Does anyone really believe, after all, that the greens would allow utilities to inject underground billions of tons of highly pressurized carbon dioxide all over the nation? They fought tooth-and-nail, after all, to prevent the storage of a comparatively small number of sealed casks of spent nuclear fuel one mile underground in the Nevada desert. But discussion of clean coal and CCS are academic since, as of January 3, 2011, cap-and-trade will be as dead as dead gets. This is because there is no cap-and-trade without CCS and you can bet that the 112th Congress — at least on the House side — will not appropriate the billions (trillions) of dollars necessary of for large-scale CCS. So clean coal is dead too — except in the minds of establishment zombies who slept through the election. If all anyone is worried about with coal is carbon dioxide, then coal is already clean — and that’s what all Republican Senate candidates believed, except perhaps for Sen. John McCain (R-AZ) and Senator-elect Mark Kirk (R-IL). Radical environmentalists are trying to put out the post-election message that support for cap-and-trade wasn’t a big negative for House Democrats. …one need look no further than the ten House Democrats who voted for the Waxman-Markey cap-and-trade bill but who voted against the healthcare bill — i.e., Reps. John Adler (NJ), Rick Boucher (VA), Frank Kratovil (MD), Ike Skelton (MO), Zack Space (OH), Harry Teague (NM), Ben Chandler (KY), Dan Lipinski (IL), Stephen Lynch (MA), Collin Peterson (MN). Of the ten, three were in noncompetitive seats (Peterson, Lynch, and Lipinski). Lynch and Lipinski, in fact, voted against healthcare because it didn’t go far enough. That leaves seven House members who voted against healthcare but supported Waxman-Markey, six of whom were defeated last night and the seventh, Chandler led by only 600 votes (out of 239,000 cast), but the race hasn’t been called yet (as of Nov. 4). So Waxman-Markey seems to have figured prominently in all seven of these races, especially in Boucher’s, considering his role in helping to craft the bill. In the Teague race, returning Congressman Pearce cited the cap-and-trade vote as one of the primary reasons he decided to challenge Teague. Sen. McConnell should wake up to the new reality in Washington, DC — a reality that does not include the discredited and lamebrain ideas of President Obama and the Pelosi-Reid 111th Congress. Many of yesterday’s Republican victors would probably just as soon have the tea party-esque and already-hip-to-the-new-reality Sen. Jim DeMint (R-SC) as their leader. If Sen. McConnell keeps prattling about ”clean coal,” he may just one day find himself in the same scrap heap as all the Democrats who were smoked yesterday for their Waxman-Markey votes. Steve Milloy publishes JunkScience.com and is the author of “Green Hell: How Environmentalists Plan to Control Your Life and What You Can Do to Stop Them” (Regnery 2009). This entry was posted on	November 3, 2010 at 6:40 pm	and is filed under 112th Congress. Never mind the fact that CCS WILL NOT WORK! I have worked on Alstom’s process as well as PowerSpan’s. Both do not work and will not work. Both offer a 30% energy penalty which means we would be consuming coal at 30% faster rate to produce the same amount of electricity. And all this for the cause of false AGW science. The earth is entering a prolonged cooling cycle. We need every molecule of CO2 we can pump into the atmosphere. 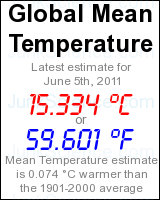 But at the current rate it will still not amount to a measurable increase in temperatures. Lamar Alexander has been put on notice by the Tea Party in his district for his loony 100 nuclear power plant plan. If he does not wise up to the truth about the insignificance of AGW, he will find himself out of job as well.